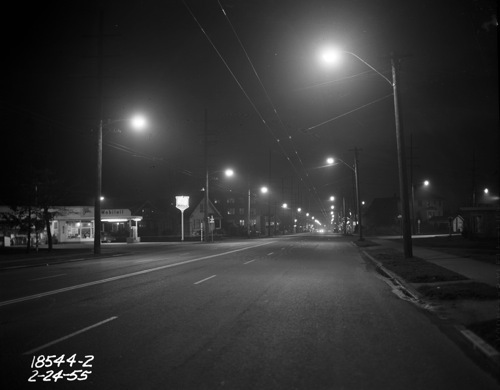 Beacon Avenue South, looking northward from roughly Beacon and Stevens, February 24, 1955. 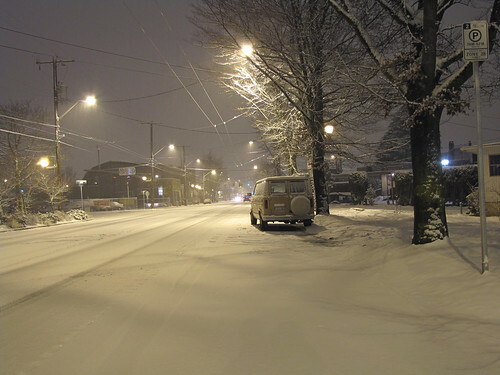 The photo was intended to show the street lights. Photo courtesy of Seattle Municipal Archives. Nearly the same shot, taken on January 11, 2011 in the falling snow. Photo by Wendi. It was difficult to match this image exactly because, though you can’t see from the photo, the snow was falling heavily and the photographer’s fingers were freezing. However, they are a fairly close match. The Mobil Station on the left is now an auto repair shop that looks quite different, but if you walk by and look behind the building, you can see an old Mobil “Red Pegasus” sign. The house beyond the Mobil station is now the Beacon Hill Library. The sign on the corner that advertised the Mobil is in the same location today, and may be the same structure. The trees that now grace the planting strip on the east side of Beacon, as large as they are now, weren’t there at all in 1955. The trolley wires are still intact for the use of Beacon Hill’s trolleybuses. Love your posts of past/present photos! Thanks! Thank you so much for posting this Wendi! In the 1955 picture, the one story building on the far right has lettering across the top – is that what is now the dentist and medical office? It almost looks like the exact same building! If the 1955 picture had been taken just a little bit more to the right they would have caught my house – I’ve often wondered what it used to look like originally. Tess, you might be able to order a historical photo of your house from the State Archives. Tess, I think you might find this picture interesting. It shows more of the medical building. And this one might show your house. That’s Triangle (Stevens Place) Park on the right. I took a present-day version of that photo but never published it because I didn’t like it. I might try again someday. Oh, and as Brook said, you can order a house photo from the archives. If your house is where I think it is, it is old enough that a photo should be available. We were able to get two old photos of our place. The 1950s one is sad because it shows that the owners then covered the nice old siding with fake brick crap. Have you tried the King County Assessors website? They now post photos of properties, but its a real mixed bag. Some of them are vintage and some are not, but you can see them online so its interesting if there is a building or home you are interested in. Hey Wendi, thanks so much for your comments (sorry I’m so late, I forget to check back sometimes) – yes, the old picture you sent a link to from 1934 DOES indeed show my house. And as you say, it’s actually a little depressing because I can’t believe how much nicer it used to look – I knew that we used to have a porch just like our neighbors! I wonder when the ‘renovations’ were made. Thanks again!